Life seems to be a lot about destinations. You know, finish high school. Graduate college. Get married. Retire. Or, on a smaller level: finish that book, get through that school year, make it to that date. That's why people have bucket lists, I guess. So they can cross off important events in their lives that they've accomplished. It does feel good to cross everything off your list. I use lists a lot, and I know the feeling. But... then what? There's a feeling of satisfaction, but are you really done with all you need to do for the day? Probably not. And did you only do everything on that list? No. I bet you did a bunch of other random things too. But, through the day, you were probably looking forward to that moment when everything got crossed off the list. Then you'd be able to relax and have time to laugh again. Same with during the year. The first day of summer, and you'll be able to breathe easy again, knowing school won't come back to bite until the fall. Wait a moment. Is that actually true? Does having everything crossed off your list make you more relaxed? Maybe. But what about tomorrow's list? Does the first day of summer make you completely content? Probably not. Because you will have to go back to school or get a job or something. If you think about it, the list of things you have to do goes on forever and ever and so does the list of days you're looking forward to. On and on and on until the day you die. We like to think that everything's all done when our lists are crossed off and that long-awaited day arrives, and often (at least for me) sigh when we realize that another one is coming tomorrow. It would be great if we could scramble and finish everything and just have a moment when there is nothing to think about. We know this obviously isn't possible though. Even after you retire, you probably still have a list of things you want to do and look forward to (at least, I'd hope so ;). We know that life isn't a destination -- it's a journey. The only destination there is that will be complete and final is Heaven. When I publish my book. Doesn't that give you a warm, fuzzy feeling? Like once you publish your book, everything will be alright? Like you'll never have writers' block again, that your plots will perfect after that and you can sit back and relax. Your book is published. You are officially an all-knowing author. Um... sorry. Unfortunately, that's not the case. Like life, writing is a journey. I'm starting to pay more attention to what authors say about their own writing. That they're always learning, that they'll never be done. You can even see this in action if you read their debut novel, then their newest novel. It's like school. You can graduate, but you'll probably still be learning new things for the rest of your life. I think that publishing a book is a lot like finishing school. You're in the big leagues now, but you'll never stop learning. Just because you're a published author doesn't mean you know everything about writing, that your plots are always perfect, that your characters are always deep, that you always have motivation to write, and that your books always end up perfect. It means you've taken a step in becoming a better writer. Because, really, do we write just to get published? Will we suddenly be perfectly happy with our writing once our book is published? Would we just stop writing and learning simply because our book is published? That would almost be like simply living to finish high school, then having no other aspirations in life after that but to bask in feeling complete. We write because we love to write. We love to write beyond getting published. Sometimes the narrow-minded mantra of "publish my book, publish my book, publish my book," can really rob the joy out of writing. It can become a goal we obsess and stress over. So yeah. Set that goal, and go after it with all your heart. But don't forget that you're on a journey, and it's a ride you should enjoy. If you feel you can't query for your novel for another year -- then wait. It's not the end of the world. If this isn't the book you want to publish -- take your time with another. Doesn't that take so much stress out of your writing? To know that you are actually right where you want to be -- writing your books. Yes, they may not be published yet, but you're writing, and you're loving it, and that is what matters. So, to dreams, to goals, but most of all, to these incredible journeys we're all on. What's the writing milestone you're looking ahead to? 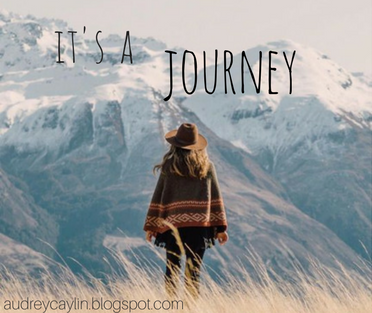 What's your favorite part of this amazing journey? You are so right, Audrey! I couldn't have said this better myself. One of the ways I look at it is I think of rock climbing (although I don't climb myself :P). You're climbing a wall or mountain that doesn't have a top, it's just endless. Of course, it's going to be hard when you climb, you're going to struggle. Eventually, you'll reach a ledge (that could be when you publish your first book) and you look back to see how far you've come. You see all the areas you struggled with, but you think, "Wow, I did that, and I learned a lot." When you continue climbing you're still going to have a hard time, but some things get a little easier. But you'll always come across a spot where it may feel like you'll never get passed it. Some spots may be a little different but they just help you learn more. And, not to mention, there are other climbers around you. The paths they've taken are more than likely different, but they don't hesitate to encourage you, give you advice. Yes, they may have gone through the same thing you're struggling with. They'll give you some advice. And you may try to use it, but in the process, you'll figure out your own way of overcoming it. I am SUCH list-maker. *hides* I love lists. But yes, there's always going to be more the next day. I enjoyed the post, Audrey! Thanks! Nice post! I can't say that this is something I struggle with. I've always had that "hey lets just enjoy the view as we go!" kind of mind set. Probably due to the fact I'm an adventure at heart, new places and new sites to see is something I look forward to. But that's also probably the artist in me. GOODNEEESSSSS. This is... incredibly profound and I CAN RELATE. *breathes in* OH AUDREY THIS WAS BEAUTIFUL AND MAGNIFICENT AND GAHGHAGHAHGHAGHAGHGA. I know my definite goal as a writer is to publish my book, but I know that it won't solve all my problems. I think that publishing is that big, bright yellow sign calling out, "YOU MADE IT! YOU DID IT!" It's like a really big step that we all want to reach. I LOVE LOVE this post, because I have an obsession with goals. I just really like to make them, and then to cross them off and feel accomplished. But, like you said, it's more of the journey that matters. Of course, goals are still important (after all, they are great motivation), but, as you said, the journey is where the joy comes from. And reaching that goal gives us joy too... but it's not the only source. Oooh alpha readers! That's super fun :D I hope that goes really well for you! Eeep! First drafts are awesome! I'm currently doing a major rewrite on a novel of mine, and it's strange to be writing original phrases rather than editing old ones. I hope that your novel turns out well! *nods* I can sort of relate to that (I'm sure if I ever get on a plane I'll want to see more places :P). It does help to look around at the world as a constant adventure. I love goals too xD They give a huge motivational boost when used correctly. That absolutely made sense! Thank you so much for sharing those beautiful thoughts! It puts such wonderful direction in our lives to know that there is no destination here that is final -- success nor failure. Yeah :P I have a bad method going in which all those lists are in my bullet journal so I can go back and see every single one of them. Buut, on the other hand, it's good to have them there because I can visually see myself taking steps on a journey of each day. This post is so encouraging, and I can also definitely relate to this kind of pressure. I'm kinda OCD when it comes to making lists, and sometimes that alone just stresses me out more than the actual "doing-of-the-list."